Posted on April 1, 2019, by icahduk & filed under News. During March 2019, at least 43 structures, a road and a school were demolished in the occupied Palestinian Territories (including East Jerusalem) by Israeli forces, displacing at least 77 people- including 34 children- and affecting a further 5,072 people (according to OCHA OPT). In the Naqab desert, southern Israel, the unrecognised Bedouin village al-ʿArāgīb, was demolished for the 141st time, and a number of houses in Palestinian towns were demolished in the North and Centre of Israel. All the demolitions and confiscations, other then one punitive demolition, were carried out on grounds of lacking an Israeli-issued building permit. Most of the demolished structures supported agricultural, herding and commercial livelihoods. On 2 March, 2019, a family was forced to self-demolish a residential extension of their house in Ras al ‘Amud, East Jerusalem. According to the family, the extension included two sitting rooms, a bedroom, a toilet and a balcony. The demolition resulted in rendering the rest of the original house not suitable for living. Three people, including one child were affected by the demolition. On 2 March, 2019, a family was forced to self-demolish a residential extension of their house in Jabal al Mukabbir, East Jerusalem. The family built the extension in 2016, and received a demolition order against it in 2017. The family appointed a lawyer who managed to postpone the demolition, until an Israeli court ruled in favour of the demolition last month. A family of seven was partially displaced due to the demolition. On 3 March, 2019, Israeli forces demolished a car repair shop in Beit Safafa, East Jerusalem. A family of seven, including five children, was affected, in addition to six workers. This was the second time the shop was demolished in the past two years. On 4 March, 2019, Israeli forces demolished two animal barracks in Jaba’, East Jerusalem. During the demolition water pipes were damaged and animal feeding trays were lost under the rubble. 130 heads of sheep remained with no shelter. The demolition affected a family of 13 people, including ten children. On 4 March, 2019, Israeli forces demolished a structure in Haris, Salfit. The structure was used as a car washing and car repair shop. The demolition affected the livelihood of a family of seven people, including five children. On 5 March, 2019, Israeli forces demolished two Palestinian houses in the village of al-Kabiyeh near Haifa, in northern Israel. Israeli Palestinian rights group Adalah says that only 4.6% of new homes built in Israel are in Palestinian towns and villages, even though Palestinians make up over 20% of the population. On 7 March, 2019, Israeli forces confiscated three residential tents and one tent used for sheltering animals in the village of Dkaika, Hebron, displacing three families comprising of ten people. On 7 March, 2019, Israeli forces confiscated one residential tent in the village of Khirbet al Majaz, Hebron, displacing two families comprising of eight people, including three children. On 7 March, 2019, A Palestinian resident from Qalansawe in central Israel was forced to demolish his own home upon order by the Israeli authorities. This is the second time the family has had their home demolished. On 7 March, 2019, Israeli forces invaded the village of Burqa, Nablus, and demolished a two-story house. The family did not receive any prior notice about the demolition. On 7 March, 2019, Israeli forces confiscated a residential tent in the village of Khirbet al Fakheit, Hebron, displacing a family of three, including one infant. On 7 March, 2019, Israeli forces carried out a punitive demolition in Kobar, Ramallah, demolishing a house that belonged to a Palestinian man who is accused of carrying out an attack on Israeli settlers. The demolition displaced two people and affected three more people..
On 7 March, 2019, Israeli forces demolished an under-construction house in Al Mas’udiya, Nablus. The demolition affected a family of seven, who were planning to move into the house a few days before the demolition occurred. Until the demolition of the house, the family spent around 200,000 NIS on the construction. On 7 March, 2019, Israeli forces demolished the unrecognised Bedouin village of al-ʿArāgīb in the Naqab desert in southern Israel for the 141st time. Locals reported that Israeli police forces secured the way for bulldozers, pointing out that women, children and the elderly of the village, were evacuated and left without shelter under rain. Villagers said that they insist on remaining in their village, adding that they will keep re-building their village. The Israeli demolitions of al-ʿArāgīb are carried out in attempts to force the Bedouin population to relocate to government-zoned townships. On 8 March, 2019, a family was forced to self-demolish their house in Silwan, East Jerusalem. The family built the house eight years ago and immediately received a demolition order. They appointed a lawyer who managed to postpone the demolition until an Israeli court ruled in favour of the demolition in 2018, giving the family six months to demolish it. The demolition displaced a family of seven, including five children. The family reported paying 100,000 NIS in fines to the Jerusalem municipality. This is the second time the family has had their home demolished. On 10 March, 2019, Israeli forces demolished a poultry house and uprooted dozens of trees near al-Arroub refugee camp, north of Hebron. Three years ago, the Israeli army had demolished a poultry house on the same land. On 11 March, 2019, Israeli forces demolished a one-kilometre road located in Area C, in Kobar, Ramallah. The Kobar local municipality reported that the road was a 2-kilometre road, half of which located in Area C (now demolished) and half in Area B. The road enabled access to about 5,000 dunums of agricultural land and a garbage dump site. The demolition has affected the entire town of 4,500 people. They also added that they did not receive any demolition order against the road. On 11 March, 2019, Israeli forces demolished the concrete basement of an elementary school in As-Simiya, Hebron. Since December 2018, the school has had its facilities confiscated and demolished several times by Israeli forces. On 12 March, 2019, Israeli forces dismantled and confiscated three structures in Area C, in the village of Nahhalin, Bethlehem. The confiscation of the two animal shelters and one resting structure affected three families comprising of 28 people, including 16 children. On 12 March, 2019, Israeli forces demolished a used car-parts garage in the town of ar-Rama in the Galilee, North Israel. The owner had been given 30 days to evacuate his garage and forced to pay financial penalties, but the final demolition order was issued against his garage only a few days prior to the demolition. 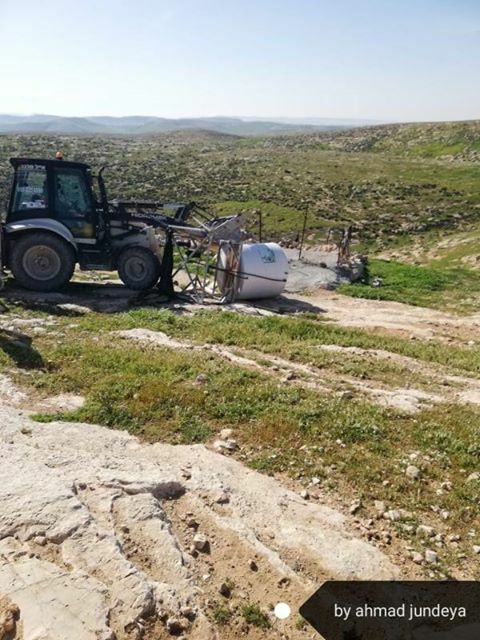 On 12 March, 2019, Israeli forces confiscated an agricultural container, used to store tools in Area C in the village of Al Walaja, Bethlehem. The confiscation affected a family of four, including two children. On 13 March, 2019, Israeli forces demolished two containers, a metal gate and a horse stable in Umm Tuba, East Jerusalem. Nine people from two households were affected by the demolition. On 13 March, 2019, Israeli Civil Administration personnel along with Israeli forces demolished five residential structures, three metal gates, a kitchen and a chicken coop in the area of Al Wata, Bethlehem. In addition, a 70-m long fence was damaged, and part of the land on which the structures were located was bulldozed. Many of the belongings of the families were lost under the rubble. 26 people from four households were displaced due to the demolitions. On 13 March, 2019, Israeli forces demolished two houses in the al-Qubbeh area, East Jerusalem. The owners said that Israeli authorities did not notify them prior to the demolition. Ten people from two households were displaced as a result of the demolition. On 18 March, 2019, Israeli Civil Administration personnel along with Israeli forces demolished an under-construction water cistern in Umm Nir, near Susiya, Hebron. Ten people, including four children, were affected by the demolition. On 19 March, 2019. Israeli forces demolished an under-construction school building in the Ras She’hade neighbourhood, East Jerusalem. The under-construction elementary school building was scheduled to start operating in the 2019-2020 school year. 450 Children who were registered in the school have been affected. On 20 March, 2019, Israeli forces demolished the entire compound-six houses, of the al Ataika family, in al-Batil, an unrecognised Bedouin village in the Naqab desert, south Israel. On 20 March, 2019, Israeli Civil Administration personnel along with Israeli forces demolished a residential structure in Tuba, Massafer Yatta, Hebron. During the demolition, one water tank was demolished, a solar panel system was confiscated and one man was arrested. A family of six, including two children, was displaced. On 20 March, 2019, Israeli Civil Administration personnel along with Israeli forces demolished a residential structure and a storage room in Halaweh ,Massafer Yatta, Hebron. A family of three, including one child, was displaced. On 20 March, 2019, Israeli Civil Administration personnel along with Israeli forces demolished an animal structure in Maghyair al Abeed, Massafer Yatta, Hebron. A family of nine, including five children, was affected. On 26 March, 2019, a family was forced to self-demolish their under-construction house in Ras al ‘Amud, East Jerusalem. A family of five, including one child, was affected. On 30 March, 2019, Palestinian family was forced to self-demolish two animal-related structures, built in 1982, in Hizma, East Jerusalem, affecting three people. The Wadi Hilweh Information Center said in a statement on Monday, 12 March, 2019, that an Israeli court informed a Palestinian family in the Silwan neighbourhood, in occupied East Jerusalem, who are the current residents and inheritors of Mariam Abu Zuweir to evacuate their home until the end of March 2019. The center also mentioned that the notice came after a petition was filed by the Israeli settler organisation “El-Ad”, which allegedly presented forged documents to claim ownership of Mariam Abu Zuweir’s property. El Ad is a private Israeli organization which promotes illegal settlement construction in occupied East Jerusalem in a bid to increase the city's Jewish presence. It is noteworthy that the inheritors are Nihad Siam and her four children; the inheritors have been battling in Israeli courts the takeover of their property by Israeli settlers for over 22 years. The center quoted Siam, stressing that the family is going to appeal to the High Court to stop the eviction proceedings until the Jerusalem District Court looks into its appeal against the eviction. Israeli settlers seized a Palestinian home belonging to the al-Halabi family, on Tuesday, 5 March, 2019, in the Old City of occupied East Jerusalem. Israeli settlers raided the al-Halabi family home, where an elderly Palestinian couple lived, and who were out shopping for groceries at the time. The couple was thrown out by the Israeli settlers upon arrival. Palestinian youths attempted to defend the home from seizure, however, Israeli police forces assaulted them and fired tear-gas bombs towards them. Additionally, the Israeli settlers who seized the home, pepper sprayed Palestinian residents and students, resulting in a number of severe suffocation cases. The house is located in a Palestinian-owned building, which has four owners; two belong to the al-Alami family, the third belongs to the Eshteiyeh family, and the fourth belongs to the al-Halabi family (amounts up to 40%) and measures 100-square-meters. 60% of the area that is owned by the al-Alami and Eshteiyeh families was previously seized by Israeli settlers as part of Israel’s settlement expansion plan. On Sunday 3 March 2019, the judge of the Israeli enforcement authority rejected the Sabagh families advocates’ request to freeze and cancel the eviction order of the five Sabagh families, which was issued on the 8th of January. The judge based her decision on the old magistrate court decision from 2012, which orders the eviction of the Sabagh families from the new part of the building which was built“without a permit, according to the judge. The advocates of the families will appeal to the magistrate court requesting the cancellation of the eviction order. Background: On the 15th of November, 2018. The Israeli Supreme Court ruled, dismissing the appeal of the advocates on behalf of the Hammad and Sabagh families from the Sheikh Jarrah neighbourhood, dismissing the opportunity to challenge the settlers’ claims of ownership of the land of the Eastern part of Sheikh Jarrah. The Supreme Court approved the ruling of the district court, which rejected the request of the advocate to discuss the ownership issue because of technical background, prescription rather than, the content of the claim. This ruling will have a serious implication on the whole case of sheikh Jarrah, and would put the situation of the families at risk of forced displacement. The advocate of the Civic Coalition, submitted a litigation, on behalf of Hammad and Sabagh families in relation to their property rights in Shiekh Jarrah to the district court, requesting the acknowledgement of the court of their rights of their homes, as they have been inhabited since 1965. Jordan provided the land and UNRWA build 28 housing units for 28 refugee families. In 1972, two settlers associations gained registration of the land in their names based on such claim and registration the settlers association sold their ownership right to Nahlat Shimon Settler Company in 2003, which requested the eviction of the Sabagh and Hammad families in the reconciliation court. In 2012, based on such claim, the reconciliation court ordered the eviction of the Sabagh family, where no decision yet was taken in relation to the Hammad family. Through the legal proceeding “It was found out that the documents on which the registration of the land was based, has no connection to the land in Sheikh Jarrah, the registration which took place in 1972, was false and forged. This was clear based on the registration file that was submitted to the court, when the district court discussed the request of the advocate. In 2016, the District Court rejected the request based on prescription (limitation), because the registration of the land by the settlers association was in 1972, which the families challenged the settler ownership claims in 2002, after 30 years, therefore the request to open the landownership file was rejected. In 2016, the advocates submitted an appeal to the Supreme Court, basing their argument that statue of limitation is not applicable on these cases based on previous court rulings and taking into consideration that the case against the Sabagh and the Hammad families was established in 2008, which only 8 years, there is no element of limitation. Therefore the Supreme Court should review the land registration file, which proves that the land ownership right is not for the Nahlat Shimon company and that the registration is false and forged and should not be accepted. On the 15th of November the Supreme Court rejected the appeal by the advocate and refused to examine the 1972 registration by the settlers association, confirming the decision of the district court, prescription and the families knew about the registration in 1979, and they could, objected to that, therefore the prescription is applicable. In response to this judgement, the families’ advocates submitted another appeal to the Israeli legal state advisor requesting an expanded Supreme court panel, five judges instead of three, since its decision contradicts another Supreme Court’s judgement from 1990/2001. This aims to cancel the last High Court decision and to re-open the land registrations file which proves the ownership rights of the families, granted to them by the Jordanian government. The families of Sheikh Jarrah are waiting for the response to their appeal.